Madam Moonshine is a witch owl who assists Hank on occasion. 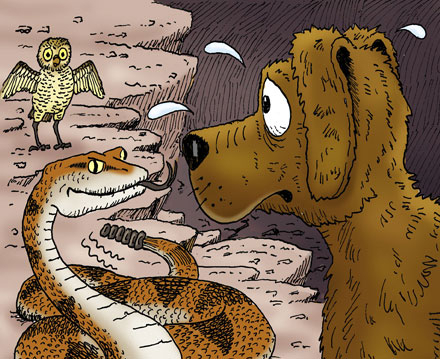 She has a bodyguard, a rattlesnake named Timothy, who lives in the same hole as her. When she does use her magic, it normally is very odd and may not have the desired results. For example, in Lost in the Dark Unchanted Forest, she and Hank were tied upside-down to a tree branch, while Rip and Snort were planning to eat them below. She recited a spell to make them stop, but, because they were upside-down, it just made them sing their song backwards.